Our flight this trip was direct to Tokyo (Narita) and left from the Gold Coast at around 11am. Unfortunately that airport is over 100km from where we live so we had to get up at the crack of dawn. 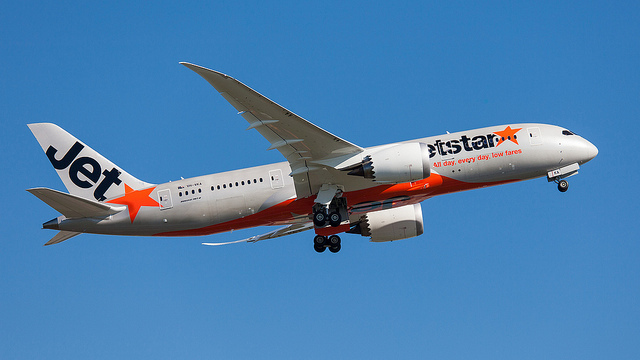 The plane we had was the new Boeing 787 Dreamliner, which was nice, though still cramped in Jetstar economy class. One major thing that's worse with this aircraft is the seat configuration as there are three seats next to the window, so we had to sit next to someone else. Apart from that it was nice to have a cleaner aircraft and the USB chargers and power outlets were nice. I think I noticed the higher humidity and cabin pressure as well. Upon arrival in Tokyo an announcement came over aeroplane speakers asking Kate to speak to the Jetstar staff. This was worrying and when we finally got to the front of the plane we were told to talk to the ground staff. We asked where the ground staff were but could not be told any further details! We nervously tried to hurry through airport but encountered a big queue at immigration. Usually the Japanese passengers vastly outnumber the Australians and we're able to quickly get through as there's next to no line. That was not the case this time, there were stacks of Aussies, and we were at the end. Quite a few had ski equipment; Japan has been exploding in popularity as a ski destination for Australians lately. In fact in January 48,500 of us visited which is an all-time record. Anyway after getting through immigration we found some Jetstar people near the baggage claim who told us that they'd lost Kate's bag! They were reasonably friendly, but spoke terrible English so I had to communicate in Japanese. Apparently it was 90% certain to have been left behind at the Gold Coast, but they were not sure. We had to describe it and were told if that was the case they would send it, or we could come to Narita to pick it up. The major issue though was that it would arrive tomorrow night, they'd send it and it'd get to us the day after. However, we were going to Korea that day and had opted to only bring a carry-on bag for our short trip! We could pick it up from the airport when we got back to Japan, but as we actually had a pretty tight schedule to get from Narita to Nikko for our ryokan stay, this wasn't really viable. Another issue was that thanks to our many one night stays, there was the possibility that our bag would arrive at a hotel after we'd already left! Basically what we had to do was go through our schedule night by night with the Jetstar staff; and the guy I was talking to took notes of where we'd be each day. After that we got escorted through customs and walked down to the train station where we exchanged our rail pass. It was quite late now and we'd missed the Narita Express train into Tokyo. When I went to reserve tickets on the next one I was asked where we were going (Bakurocho) and was told that the next normal train would get us there faster as the next Narita Express didn't come for a while (and required a change). So that was kind of convenient, though it wasn't too much fun sitting on the slow train for ages and ages even if it was faster in the end. Also the Narita express is much more comfortable, we got a blast of cold wind at every one of the main stops. Anyway it got us there faster which was the main thing. Upon arriving we checked into the Kanda Akihabara Toyoko Inn hotel. Waiting for us was our pocket WiFi as well as a ticket to tomorrow afternoon's Lisani concert! Also for tomorrow we had some clothes shopping in Ginza planned in the morning. It was mainly for me to get some warm things for this trip but would now be very useful for Kate as she had nothing to wear for the next few days.